This past Saturday, preceding the Fall 2017 Commencement Exercises from the College of Engineering & Computing, all graduating engineers were inducted into the Order of Engineers at the Induction to the Profession Ceremony. Mechanical engineering graduate, Grecia Rodriguez Dominguez was among the inductees and achieved further recognition as she was awarded the Outstanding Bachelor’s Graduate Award. The award is given to an undergraduate student who has excelled within the classroom, extracurricular activities, and professional success. Rodriguez was a member of the Engineering Honors Society and Tau Beta Pi. She was also involved in several engineering clubs such as FSAE, SHPE and the Eco Engineering Club as an executive board member. 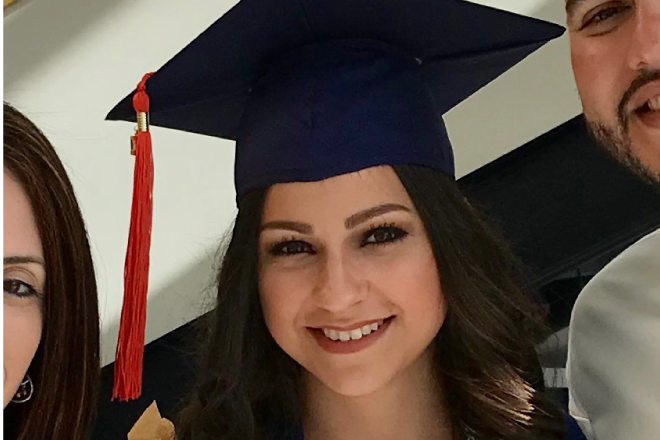 Participating in these clubs allowed her to gain the technical hands-on experience that she needed to represent FIU at the National Shell Eco-Marathon Competitions and to develop the interpersonal and networking skills required for a successful career. Additionally, Rodriguez was very active in the community. She has participated in the Engineers on Wheels and Night of Science events, teaching high school students the importance of studying STEM disciplines and the fun that can be had while doing hard work. She has volunteered as a tour guide for the Engineering EXPO, club fairs, and open houses, where she has shared her experiences as a Latina and an immigrant feeling welcomed into the FIU community. Recognition of Rodriguez’ accomplishments were multitudinous as she received the FGLSAMP Award, the Association of Cuban-American Engineers Scholarship, and the Dean’s Scholarship. Rodriguez also made the Dean’s List every semester while attending FIU. Graduating with a 3.86 GPA, her academic success and community involvement translated into professional success when Rodriguez obtained the opportunity to intern with Lockheed Martin while attending an engineering conference.